Union. Mystical experience. Spiritual home. Unity comes first and last. In between we have the illusion of duality, which we all believe in for a very long time. This apparent duality is ultimately shown to be an illusion, but it is an illusion through which we learn and grow, and then once again return to Unity. You may have had mystical experiences where you have had true union with other beings or even with the Unity, the One Who Is All. Such experiences change our lives, effectively showing us that the saying “we are all one” is not just a pious belief but is a statement of actual fact. We are not seperate like the flowers in a field, but are one. The only way to reach this awareness is to surrender the small everyday self to the larger spiritual self, which is Unity. Experiencing full oneness with the Unity is transformative. 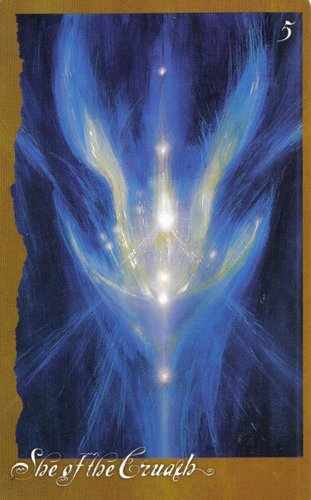 Looking at this painting, one observer notes, “All the power is focused in here, vast energies. It is as if all that power is looking for a place to happen.” This is exactly what is going on. Unity is the energy of the cosmos still unmanifest, still without form. Here we see the dark and the light, masculine and feminine, active and passive, and other polarities, all expressed in balanced, energy-filled, vibrant union. “All That Is is one, and that One is god/dess” is the principle expressed. From this, all else derives. This is the source from which we draw our strength, our very being. 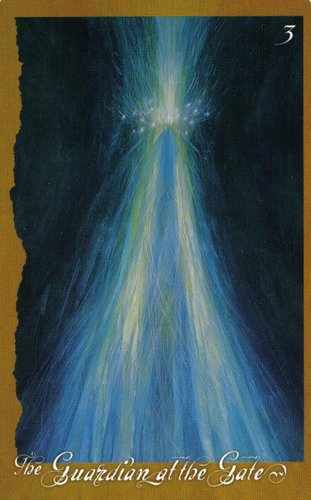 When this card comes up in a reading, it is asking us to remember the mystical concept that we are all one, unified in a holistic universe. It reminds us to look at the needs and goals we have in common with others, and to seek cooperation and community action rather than attempting to do everything on our own. To achieve our goals, we need the active cooperation of others; and to get that cooperation, we must be helpful to them and willing to work with their ideas as well as our own. It suggests that we think of things in terms of equal partnerships rather than in lines of hierarchical authority. Unity also tells us that we have much to gain by remembering our own wholeness. Resolution of inner conflict is often necessary before we move ahead. It is important at this time that we work toward cooperation and reconciliation, within and without. Seek the highest good. 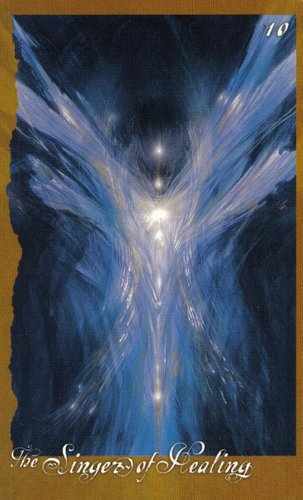 Ask for the divine energy of Unity to permeate and guide you. We may have become overly focused on the differences and disagreements that seem to separate us from others, and this may be preventing us from achieving our potential for fulfillment and happiness. We may feel alienated, unwanted, and lonely. If this is so, we need to refocus on what we have in common with those around us, far and near. We may need to heal our own attitudes and our beliefs that contribute to these feelings of separation, and we could usefully consider how we might find reconciliation with others. Forgiveness may be a key. Prejudice and judgmental and critical attitudes all push us farther into the delusion of separateness and loneliness. Move toward allowing others to be closer to you, gradually dropping the defensive attitudes that hold them away and keep you alone. Don’t wait for others to make the first move toward reconciliation and connection but reach out to them with compassion and selflessness. This may be difficult, even very difficult at first, requiring self-study and inner work, possibly with the help of skilled teachers or therapists. In meditation and prayer, ask to be in communion with the Unity deep within yourself. In Unity there is trust, love, and ecstasy. Music. Order. Harmony. Seduction. Empathy. The secret melody of the Piper drifts through our lives, offering us a means to communicate from the heart and without words. His music conveys our emotions to one another, emotions that are audible only in the listening ear of our hearts. His approach to us is gentle and wordless. He may send us his melody through the whisper of leaves, the rustle of grass, the song of a bird, the hum of city traffic, the buzz of a refrigerator, or the whirr of a computer. He asks that we listen to the world around us, especially to the unspoken words of others, humans and faeries, plants and trees. Among the other things the Piper offers us is the ability to bring him our sorrows and pain in the form of music so that he may help us to heal them. 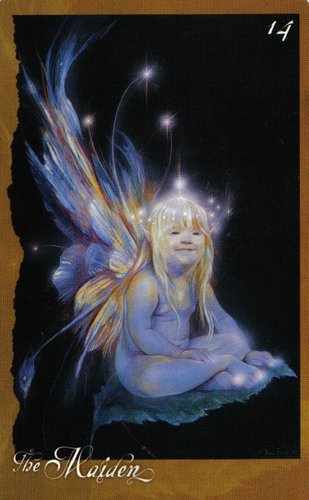 Sing a sad song to this faery and he will add to it the energy of cleansing and healing, if we are open to healing. His natural music offers us tranquility, if we take the time to be still and listen to it. The Piper’s music can be seductive and attractive – even magnetic. He lures us with our own daydreams. Sometimes, we allow the music of the Piper to enthrall us into illusion, especially the illusion of control over that which we cannot control. However, if we use that illusion (our own self-deceit) to break through into greater truth, it has served its real purpose. 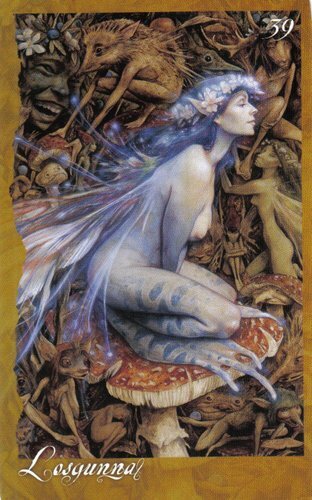 He calls to us, asking that we listen – listen to him, to the faeries, to each other’s hearts. 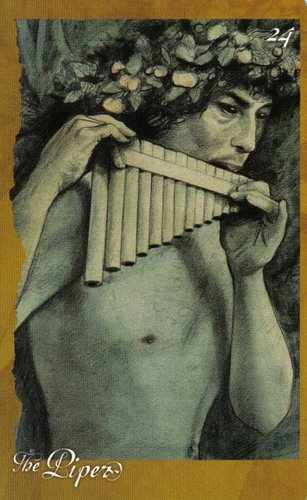 His piping may seem elusive, hard to hear, diffused, yet it is very clear and it brings us the meaning of our lives. Working on developing more order, harmony, and beauty in your life? Then you are singing to the tune of the Piper – and becoming more like him as you do. To get what you want, the Piper recommends that you try polite requests and gentle, patient persuasion – and then wait, quietly welcoming, for it to come to you. Seek harmony and tranquility in yourself and in the world around you. Use tenderness and gentleness. 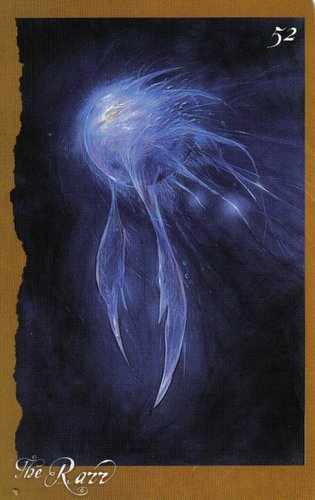 This card speaks of a time of harmony, creativity, and increasing order. It tells of communication without words – the music of empathy and the awareness of the feelings and concerns of others. This is a time to pay attention to the subtlety of others’ expressions of feelings and ideas. Look past the surface and listen as you would to a beguiling melody on the very edge of hearing. He also plays melodies in our dreams, which may be filled with meaning and importance, and then he leaves it up to us to understand what they mean. This may also be a good time to be aware that others may be listening to us with sensitivity and clarity – so much so that they may hear what we are truly saying more clearly than we do ourselves. 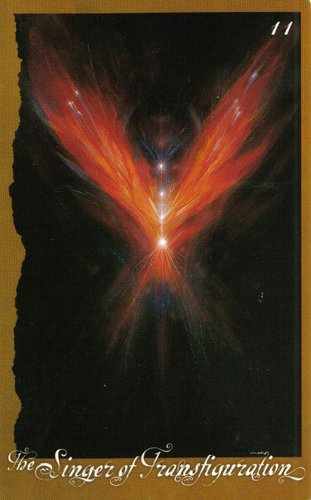 This card may also signify musical talent or ability, or it may be suggesting that the use of music is in some way important at the present time. When we have blocked out the melody of the Piper we can be like someone mesmerized, lost in a dream, stagnating. 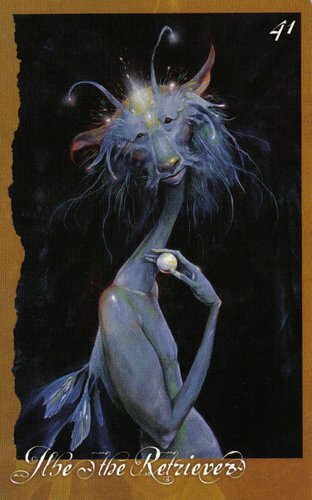 Alternatively, this card may represent people so vague and diffused that they are insufficiently earthed to be be able to keep commitments – or even to remember that they have made them and it wasn’t just another fantasy. Self-absorption, moodiness, and self-deceit can be problems. Altogether, unreliability and untrustworthiness are a real problem. Look at the other cards to see if anything can be done to rectify this or if you just have to take this into account and make your plans accordingly. When the power of the Piper is twisted, it becomes manipulative and may be aimed at seducing others into something against their judgment or ethics. It becomes like a spider waiting at the center of a web to entrap someone. One of the worst abuses of this energy is to use our empathic understanding of the needs, hopes, and dreams of others to attempt to lure them into self-destructive ways, especially by playing on their illusions, delusions, and confusions. Trickster. Creative chaos. Wild gifts. Breaking habits and patterns. This is the Trickster, who exists in every world. He comes to us wearing our own faces to fool us into thinking that his ideas are our own. He brings creative chaos into our lives. He helps us break down old habits by showing us how silly they are. He encourages us to fall on our faces so that we get a different point of view, looking up past our mud-smeared noses. He helps us get ourselves into situations in which we discover gifts we never knew we had – often because there is no other way out of the mess we got ourselves into. As Brian mentions, That Gnome is unreliable and sometimes encourages drunkenness. This is true… he certainly doesn’t always do as we expect – but our expectations are our problem, not his, he says. As for drunkenness, in vino veritas (in wine, there is truth). When we let down our mental censors and filters, we sometimes come up with discoveries about who we really are and what we really want that we hadn’t let ourselves know. When he appears, it is breakthrough time, and all too often, the first step in breakthrough feels just like breakdown. There are better ways of doing this than getting drunk or going through a psychotic break, but the better ways take skill, and he has to work with what he has – us, just as we are. If That Gnome breaks a vase, the pieces will fall into patterns of great significance and meaning – but it is up to us to read and understand it. He is the potentially constructive force of chaos. 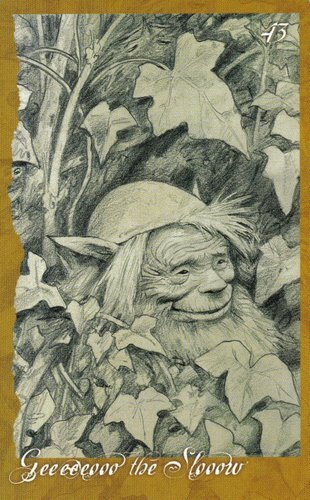 That Gnome is also the keeper of our wild talents, the ones we may not even know we have. When he appears, it is often to call our attention to our latent gifts. In a nutshell, which is where he claims to belong, his job is to help us get lost from our comfortable ruts so that we will explore wonderful, exciting, and strange new paths. He is a good friend of Raven, the philosopher-trickster, and Coyote is one of his many disguises. He is so smart that he sometimes outsmarts himself. Can you laugh at yourself sometimes? And let the laughter carry you into new insights and new ways of being? 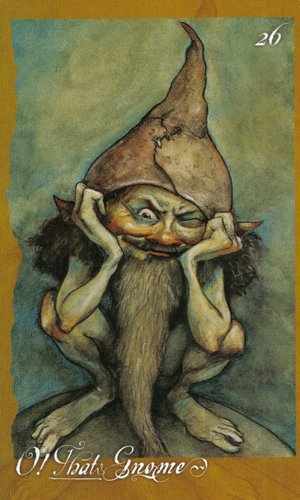 Then That Gnome within you is waving his faery wand gleefully. It’s time to leap into the air, letting the earth turn beneath you, and discover where you come down again. Reasonable risks are okay. Even unreasonable risks are probably okay. Use your head and look before you leap, of course, but do so understanding that the actual jump is likely to be very rewarding. No guarantees, but then there never really are anyway, no matter how pretty the paper they may seem to be printed on and the scrollwork around the edge. But which, you ask, is the real answer? Oh, you want that kind of an answer? A neat one in a box? I’m sorry, but That Gnome doesn’t do those kind of answers. 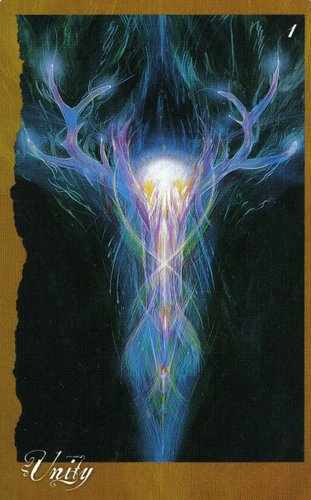 He is just here to shake you up, jolt loose some preconceptions, help you to see yourself and your situation as it really is, and aid you in finding a new and unorthodox response. That’s all.